No trip to Hong Kong is complete without trying their street food. 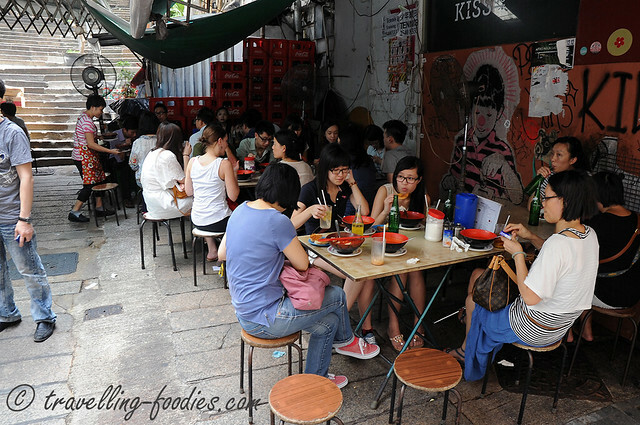 No doubt, there’s a lot of good food in Hong Kong, be it dim sum from the tea houses or roast goose and char siew at the Cantonese restaurants but for many of us, what characterises the cuisine of a place is its street food. It is eating what the locals eat that makes travelling to these places a truly remarkable experience. And Hong Kong is not short of good street food. Everywhere we went, it is always easy to pick up some local delights, be it 碗仔翅 “faux shark’s fin soup” or 臭豆腐 smelly beancurd. For those with sweet tooth, there is 雞蛋仔 crispy egg waffles or 砵仔糕 red bean rice cakes. And if one doesn’t have the time to even stand by the roadside to savour these delicacies, one can always grab a skewer of 咖哩鱼蛋 curry fish balls or 鱼浆燒賣 fish paste siew mai to go! We’d been to 勝香園 Sing Heung Yuen before during our earlier trips, and we came back again during our most recent trip to reprise the roadside dining experience at a 大排檔, something truly Hong Kong!